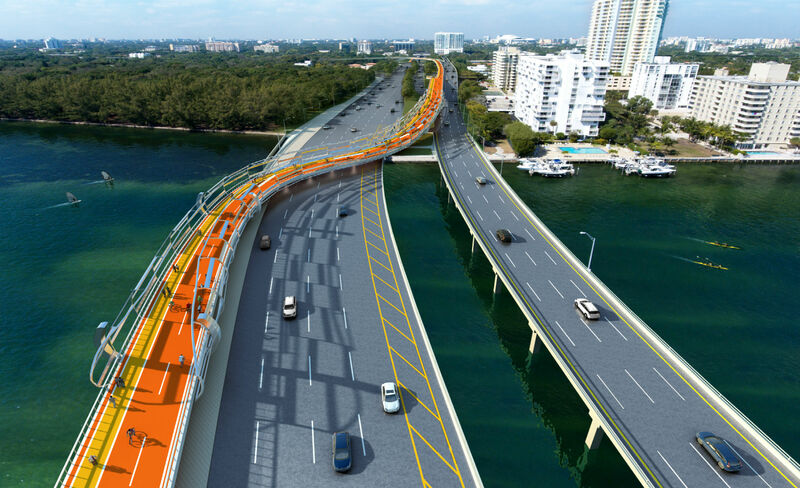 Bernard Zyscovich's Plan Z for Miami proposes a bike bridge along the Rickenbacker Causeway to address the growing dangers for cyclists and pedestrians. A new exhibit at the Coral Gables Museum is now on view, providing a deeper look into "Plan Z for Miami," a proposal to create a snaking elevated platform that would provide pedestrians and cyclists with safer passage from Miami to nearby Virginia Key and Key Biscayne. The existing Rickenbacker Causeway has seen four fatal cycling accidents since 2006, spurring many cyclists to push for better bike lanes and barriers to protect them from the high-speed traffic on the bridge. Architect, urban planner, and lifelong cyclist Bernard Zyscovich saw an opportunity to promote cycling as a more viable means of transportation in Miami and launched Plan Z for Miami. 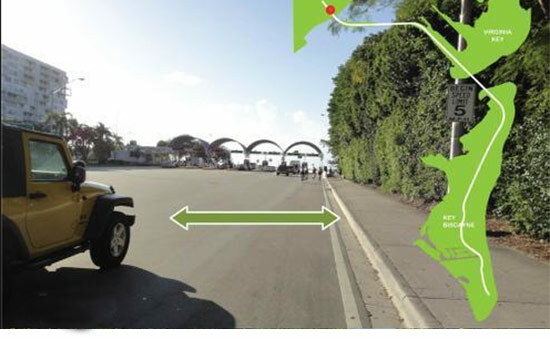 The nonprofit organization has proposed two separate plans to convert Rickenbacker Causeway, the first of which involves the removal of a lane of traffic from the causeway to create a 16-foot-wide bike and pedestrian lane, separated from the motor traffic by a strip of native foliage. After concerns were raised about the removal of a lane of traffic, Zyscovich returned with Plan Z 2.0. 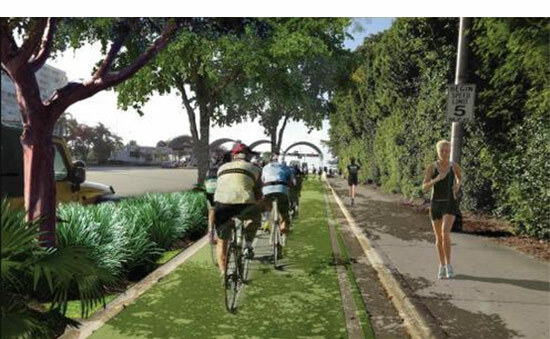 This bolder plan proposes a completely separate bike and pedestrian lane to run the length of the causeway and connect to the proposed Underline, a ten-mile linear park running under Miami’s Metrorail. The path would then run along the William Powell Bridge, providing an observation deck for viewing the Miami skyline, then continue on to Virginia Key. Zyscovich’s plan also imagines a 20-acre waterfront park and beach at the entrance of Virginia Key, with a branch of paths connecting to Virginia Key Park, before continuing on to Key Biscayne. 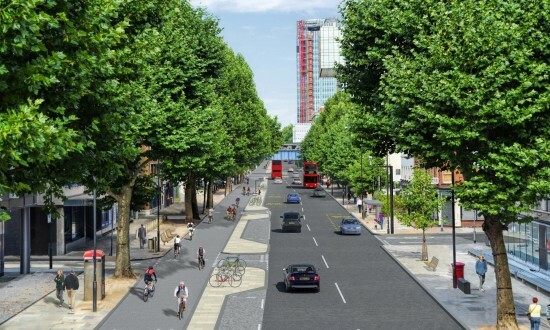 The project has already garnered a decent amount of positive attention from the community, according to the architect, and they will continue to show the plans to the public to rally further support while the project is in review for potential funding. The exhibit, titled Plan Z for Miami: From Infrastructure to Open Space, will be on view through May 14, 2017, at the Coral Gables Museum. For more information about the exhibit, visit the Museum’s website here. For more information about the Plan Z project itself, you can visit the organization’s website here. 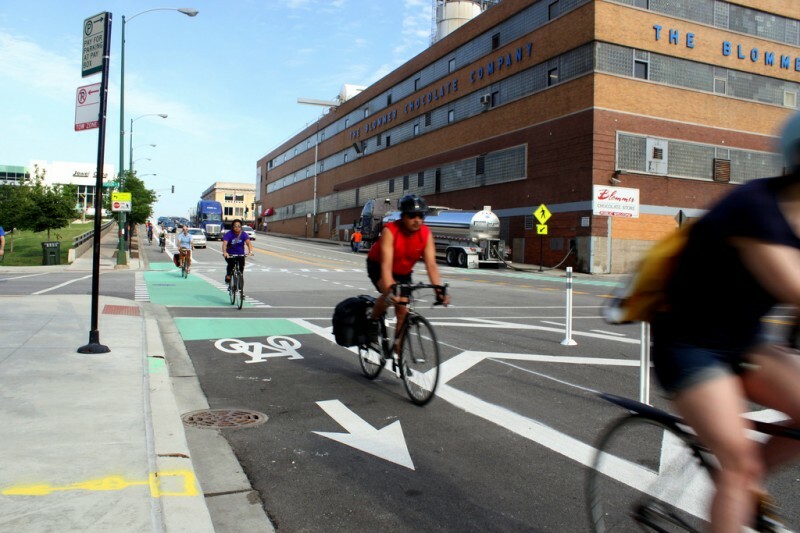 Where Are Chicago’s Most Bikeable Neighborhoods? Steven Vance, editor of StreetsBlog Chicago and frequent contributor to AN, dug through Walk Score's breakdown of the most bikeable neighborhoods in Chicago. 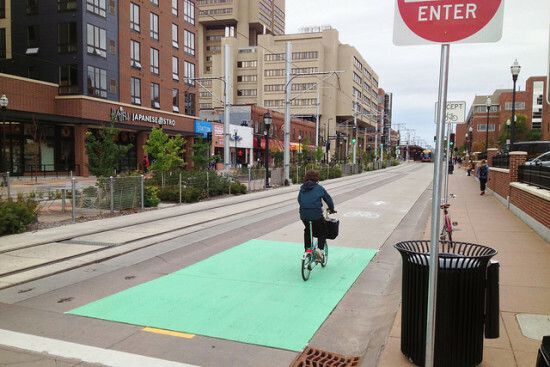 The rankings are based on several factors, including the prevalence of bike lanes, connectivity, commuting mode share and hills. 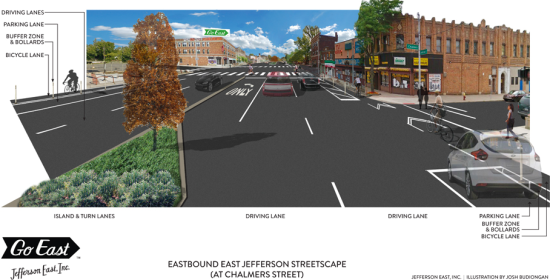 It also considers the number of neighborhood destinations and, as Vance points out, may consider a shared lane marking as a bike lane. That led to the Illinois Medical District’s surprising fourth place ranking, tailing East Ukrainian Village, Ukrainian Village and Wicker Park. See the national list of WalkScore.com’s most bikeable neighborhoods here, and read StreetsBlog’s post here. 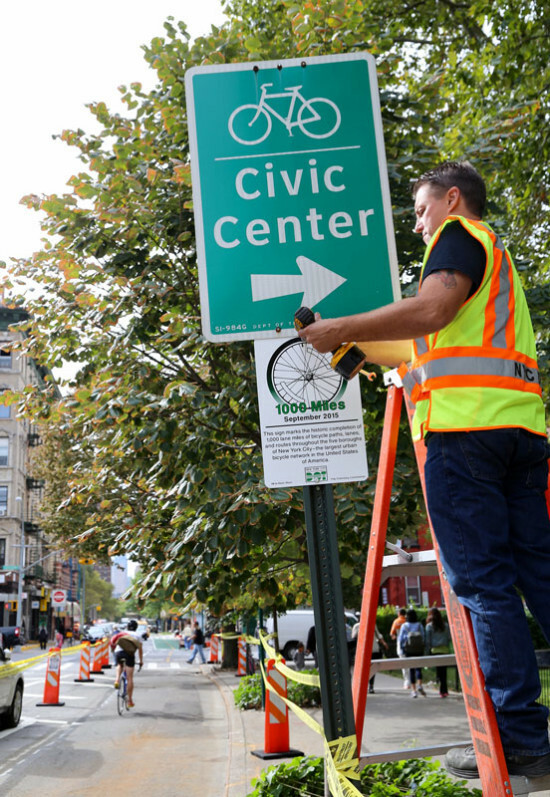 In a city where bicyclists may share a lane with Transportation Commissioner Gabe Klein, last year’s promise by Mayor Rahm Emanuel of 100 miles of protected bike paths was cause for celebration. Chicago's latest project, announced Sunday, will be a protected lane along Dearborn Street in the Loop that will run in both directions from Polk to Kinzie. The new route connects the near north side with the south loop and is designed to appeal to young, tech-savvy commuters who work downtown. “It will help us recruit the type of people that have been leaving for the coast,” Emanuel said. “They will now come to the city of Chicago.” The Active Transportation Alliance circulated a petition to hold the Mayor’s administration to its word. Others, like the Sun-Times’ Mark Konkol, have called protected lanes a waste of money and decried a faulty “cyclist culture” that makes streets more dangerous for pedestrians and bikers alike. Chicago will add 22 miles of protected bike lanes by the end of the year, bringing the city's total to 33 miles. A shocking cellphone pic of New York's senior Senator has transportation circles abuzz across the Internet today. 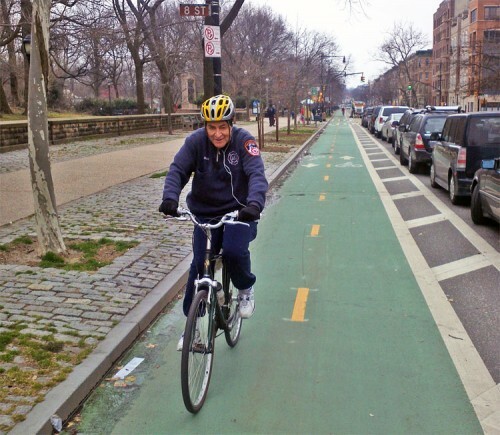 While not so much a scandal as a beautiful bike ride in the park, Senator Chuck Schumer was photographed pedaling down a contested bike path in Brooklyn on Sunday by Paul Steely White, director of Transportation Alternatives. Given his close ties to a group fighting the bike lane—his wife and former NYC DOT commissioner Iris Weinshall was among the most outspoken opponents to the path—a hypothetical snapshot of the senator biking had previously been called the Holy Grail of livable streets activism and been the punch line of April Fool's jokes, but Schumer, who had never taken a public stance on the protected lane, sure appears to be enjoying himself in New York's unseasonably warm weather. 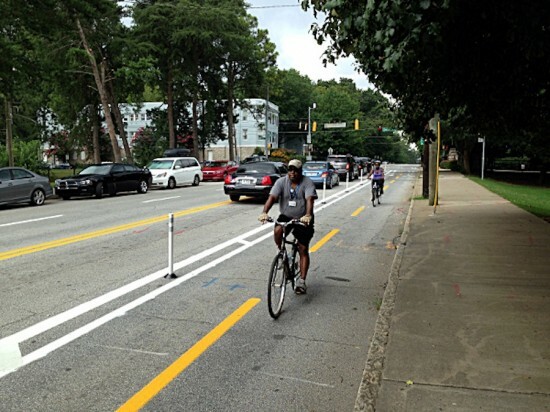 The Orwellian-named Neighbors for Better Bike Lanes had actually been fighting the protected bike lane since it opened in 2010, but a judge threw out the case last year, citing a lapse of statute of limitations. The group has since appealed the decision. Steely White told WNYC's Transportation Nation, "I saw what looked like Senator Charles Schumer riding on the Prospect Park West Bike lane. I whipped out my cell phone and snapped the shot, and as I was taking the photograph he looked at me and smiled and said, 'I ride all the time.'"